Summer brings longer days, garden-fresh produce, ice cream treats, vacations, and "staycations." For the most part, it is a time of fun and relaxation. But summer also brings an increased chance of thunderstorms and fireworks—events that can be scary for your dog. While some breeds of dogs may be more prone to fear of loud noises than others, it is more likely that temperament and past experience will influence a dog's sensitivity and reactivity. Dogs that have not been exposed to a variety of sounds or experiences—or rescue, shelter, and/or abused dogs with tough times in their pasts—are vulnerable to the fear of thunderstorms and fireworks, and are at risk for other scares, too! Dogs can indicate their fear in a variety of ways, with symptoms ranging from minor to extreme. Some common symptoms of fear can include: shaking, whining, hiding, pacing, urinating or defecating, or destroying property or items that a dog might otherwise leave alone. The simplest solution is to limit your dog's exposure to the experiences that create anxiety. Avoid events where fireworks are likely. Monitor weather forecasts to ensure that you are safe at home, or at least inside, before an impending thunderstorm arrives. Create a safe environment for your fearful pet. Consider using "white noise" or soothing music to mask the sounds of a storm or fireworks. Make your pet's crate safe and welcoming, perhaps offering a special treat as a distraction or enticement. Utilize other distractions that might shift the focus from a fright, including fun games or calm activities your dog enjoys. How about some in-house ball-playing or tug, or extra petting and a special soothing massage? Consider your own feelings about storms and loud noise. Make an effort to limit the transmission of your own anxiety, if it exists. 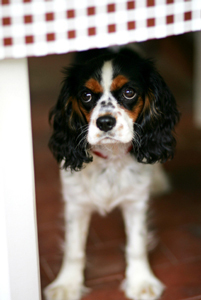 Most dogs are highly sensitive to the moods of their owners and will pick up on a skittish or jumpy manner. The goal is to reduce anxiety levels, not to add to them! Try a Thundershirt or Ultra Calmer Collar to reduce your dog's anxiety and provide a sense of calm and comfort. Even when a storm has passed or holiday fireworks have sizzled out, your pet may exhibit lingering effects of fear. Be patient and loving. While your pet may never be free from anxiety associated with thunderstorms or fireworks, a well-managed "loud event" may make the next event easier and less intense. If your dog's fear of fireworks or thunderstorms seems extreme or is not mitigated in any way by these strategies or other efforts, consider a professional consultation. Your veterinarian or a credentialed behaviorist can offer additional strategies for aiding a pet that is truly suffering. With a variety of options for helping your pet through scary storms and loud fireworks, the focus of the season can remain on pleasure and leisure. Happy summer!